Deep-drawing operations require holding forces—called blankholder forces, draw-pad forces or binder forces—applied at the flat-blank flange area, to control material flow. This force must be sufficiently low to allow material flow into the die cavity to produce the required part shape with minimal stretching and thinning, yet high enough to prevent wrinkling. The surface of the blankholder contacting the sheetmetal usually is smooth or polished to help ease material flow. When deep drawing irregularly shaped parts, some areas may be left intentionally rough to increase local friction and balance material flow. Blankholder-force guidelines found in technical handbooks tend to work well for deep drawing flat-bottom cylindrical cups and rectangular boxes with vertical walls. The blankholding process window—the range of forces that will produce acceptable parts—can be quite large for these types of parts. Many deep-drawn cups do not have flat bottoms or vertical walls; some have tapered walls or hemispherical or dome-shape bottoms. All have one thing in common: The need for high blankholder forces. Insufficient blankholder force will prevent the workpiece material between the draw post and the die entry radius from becoming stretched tightly across the punch face. When this loose material buckles, waves and wrinkles can form in the unsupported region. When cups are designed with full-hemispherical bottoms or partial domes, stampers must give special consideration to the forming process, because the process changes from simple bending of material over the punch radius—the case flat bottom-cup drawing—to stretch forming across the punch face. The drawing of dome-shape cups combines stretching and drawing. When a dome-shaped draw post contacts the blank, the material is stretched in all directions. This stretching requires enough blankholder force to keep the blank from drawing into the cavity too soon. If the blank does begin to flow too soon, the material may pucker in the unsupported regions. The term “pucker” is used here to distinguish between these stretch-forming wrinkles and conventional draw wrinkles. As the dome shape approaches that of a full hemispherical shape, the importance of balancing blankholder forces and material flow increases. As soon as stretch forming is completed, the blank flange must begin to draw inward. Otherwise, the punch will continue to stretch material in the dome area, causing it to tear or fracture. 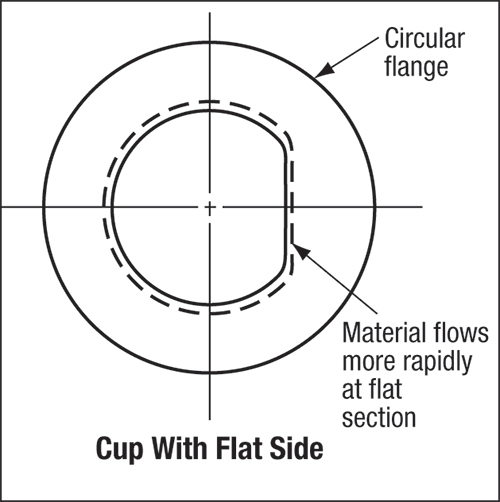 Drawing a cone shape—a cup with significantly tapered walls—from a flat blank requires substantial blankholder forces. The likelihood of the material fracturing early in the punch stroke is high due to the small punch-face diameter and tight radius in the bottom of the cup. Successful drawing of cone-shape cups often requires a stepped-cup approach (Fig. 1), with two or more body diameters in the drawn shell. 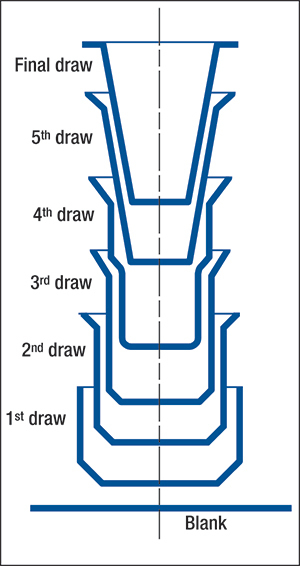 Stampers produce step-shells by stopping the redrawing process partially through the press stoke, so that only a portion of the shell is redrawn. The step shell is drawn into a cone in the final draw after the appropriate step reductions have been made. Axis-symmetric cup drawing is rather straightforward and easily understood. However, not all cup drawing is symmetrical about the cup axis. For example, consider deep drawing a non-symmetrical shape such as an ellipse (Fig. 2). This task becomes difficult due to the unbalanced flow of material toward the draw post, caused by the disruption of the uniform compressive loads found in axis-symmetric cup drawing. 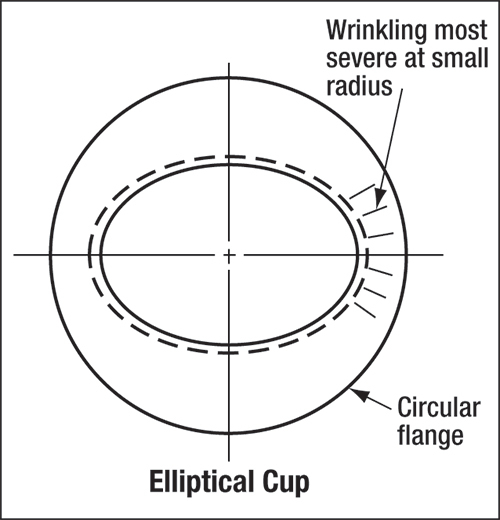 Compressive forces during elliptical cup drawing peak in the area of the smaller radius, where failures such as tearing and fracturing most likely will occur. To reduce compressive load, the stamper can notch the blank in the smaller-radius area, provided the notch does not adversely affect the final product trim. It may be necessary to reduce the percent-reduction or cup-wall heights to successfully deep draw elliptical shapes. Another example of a non-symmetrical cup: A flat side on an otherwise round cup (Fig. 3). There, the blank material at the flat portion of the cup may flow too quickly and leave loose material in that portion of the cup wall. The material flow in the area of the flat may need to be controlled or restricted by additional blank material or by the use of draw beads. Stampers use draw beads to control blank movement, especially when deep drawing irregular shapes. The beads force material to bend and unbend before entering the die cavity, creating a restraining force that causes the sheetmetal to enter the die cavity at a reduced rate of speed. The height, shape, length and quantity of draw beads determine the amount of restraining forces generated. Draw beads must be fully set before any material flow begins; setting the beads requires increased blankholder forces. it's really useful for us.How to calculate Blank holder force for cup drawing and Biw Parts.what are criteria to select Blank holder force? Eric, your statements regarding stand-offs are absolutely correct. Unfortunately, standoffs are not als practical in many progressive die and/or small part applications. Thanks for the contribution! regarding your assertion that "force must be sufficiently low to allow material flow into the die cavity to produce the required part shape with minimal stretching and thinning, yet high enough to prevent wrinkling." if Stand-offs (equalizer blocks, kiss blocks, spacers) for the blank holder are used we can use substantially higher forces (to assure flatness) while not overly restricting the metal flow. If the stnadoffs are fractionally greater than metal thickness this also minimizes the sensitivity of spotting on metalflow, but often requires the use of drawbeads.